A new owner, an undisclosed company, bought Twinject, its generic copy, Greenstone and its single dose version, Adrenaclick. This new owner is Twinject's 5th owner. An other group was interested in keeping these well designed unique autojectors on the market but their interest was too late as the sale was already made. It is believed the buyer may have bought it to keep competition off other devices. I made calls to Twinjects former owner to confirm what I have just shared with you the reader. In my opinion, Twinject was and is the best epi auto injector ever made IF one has just a little mechanical skill as it is small making it easier to carry anywhere. It has 2 doses that can't be separated. The two doses in one autoinjector is safer for the 1 in 3 possible biphasic episodes of the patient than 2 units like Epipen that could be separated with minimum pressure releasing their plastic clip leading to possible death of the biphasic patient when the 2nd dose is elsewhere. During this time, Intelliject was apparently close to settling the lawsuit that was keeping it off the market. 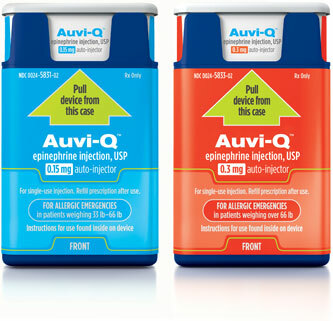 That suit appears settled, in fact the FDA on August 13 approved Intellijects "talking" autoinjector which is now named Auvi-Q. Paul Chew is the chief science officer for Sanofi Aventis USA, the company said to be marketeer for Auvi-Q. Auvi-Q is hard to pronounce, bulkier than Twinject and not designed for back country cold weather use. The life of batteries shortens below the 50 degrees frequently found outdoors. However it does fit today's high tech folks. But gosh, this is big and awkward and battery dependent. Not for me.